Terrace Awnings are excellently designed to enhance your business image by illuminating or graphically embellishing. Poddar Wallpaper & Blinds Co.
We are offering our clients a quality range of Terrace Awnings. 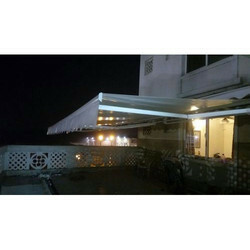 These Terrace Awnings are manufactured from qualitative range of raw materials. Our customers can purchase from us an ample range of Terrace Awnings. These Terrace Awnings that we offer gives protection from the harsh sunlight and heat. Terrace awnings have different size and colour with strong aluminum frame and polyester or at relic fabrics. It will provide you safety and comfort. A Beautifully Adorned Terrace with Path-Breaking Architecture, gives you the freedom and space to take your Guests to the Next High!